Architects and Developers struggle in determining the level of noise control required for clients and projects. In the multi-family industry, a great debate occurs on what level of noise control constitutes acceptable performance for condos, apartments, or retirement communities. 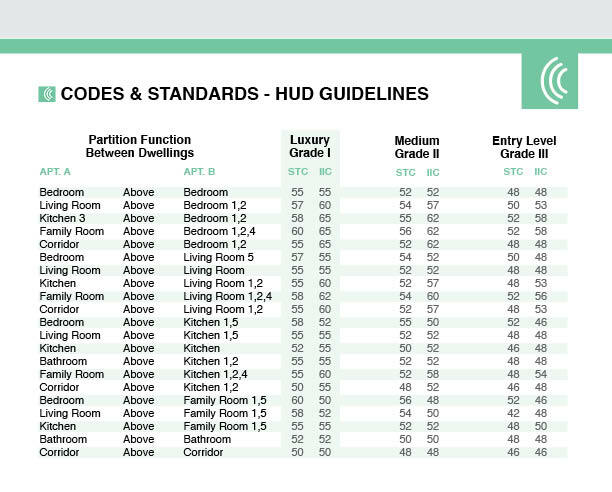 Codes influence minimums & terms such as “luxury” imply a performance above minimum. When faced with these types of decisions, the above information provided by the Department of Housing & Urban Development can be a strong independent influence. No guideline can take all client expectations into account & some overly sensitive issues with noise will always occur. Architecturally speaking, some of the code requirements are difficult to achieve at the luxury level with wood frame construction. Taking cost out of the equation, all targets can be achieved. For specific testing on specific assemblies, please contact KEENE BUILDING PRODUCTS for proper product selection.